Select a product or service category from the store navigation bar located at the left side of the page. Continue selecting sub categories until you find the item of interest. Select the item and quantity and then select Add To Cart. The Item will be added to your shopping cart and you will be taken to your shopping cart at which time you will be able to select a higher quantity than one for many items. If you want to purchase more items select Continue Shopping and you will go back to the shopping page you were on. Continue selecting items to purchase until you are finished shopping. You may view your Shopping Cart at any time by clicking the icon located at the top of the Aqua Store. You may delete items or change quantities of an item on the shopping cart page. When you are finished shopping, go to your shopping cart page and select Proceed to Checkout. On the checkout information page you will enter all the information required to process your order. When finished select Review Your Order from the bottom of the page. You will now be taken to the Order review page where the contents of the shopping cart and processing page are summarized for your final review. If there is something out of place you may go back to either page to make a correction. From the order review page you will then select Pay with Pay Pal of Credit Card. You will be taken to our Pay Pal Virtual Terminal for payment. Select pay from Pay Pal or Credit Card and continue as directed. A confirmation/receipt e-mail will be sent to you for your convenience. U. S. Mail: If you do not have a credit card or are uncomfortable ordering on line, you can select all the items to be purchased from the online store, click proceed to checkout, fill in the information page, select review, then select pay offline. An e-mail will be sent to you reflecting your order; you may then print the confirmation e-mail and send italong with your check or money order to Capitol Pools LLC; our address is located at the bottom of this page and on the confirmation e-mail sent to you. Your order will then be processed accordingly. Telephone: You may order over the phone by calling 608-837-7665. Capitol Pools will be there to assist you Monday – Friday, 9:00am – 5:00pm cst. Checks returned NSF are subject to a 25.00 NSF Charge and all reasonable collection charges and attorney fees. Capitol Pools has a flat rate shipping and handling fee based on the distance from Sun Prairie, WI and the total price of the order. Orders for items within 100 miles of Madison, WI are have the following shipping and handling fees. There is no shippinng and handling fee on items ordered along with a pool opening, closing, service call or when we are installing a purchased item. Orders beyond 100 miles from Madison, WI may have additional shipping & handling fees; Capitol Pools will contact you if there are. Items ordered together may be shipped separately, but you will only be charged for one shipping & handling fee. Stock Items are shipped within 24 hours Monday – Friday via UPS, Fed Ex Ground, or Spee Dee Delivery. Non-stock Items or custom orders may take 5 business days or longer to ship. ** Flat Rate Shipping & Handling for pool salt and filter sand applies only to Dane County WI or within 30 miles of our business location, or when we are going to your house for an installation or other service, (i.e. pool opening, pool closing, installing a piece of equipment, service call for repair, etc.). 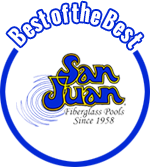 Shipping for San Juan Fiberglass pools and spas is calculated seperately from and does not qualify for flat rate shipping terms. Stock Items: If you are not completely satisfied with your purchase, you may return it (in new condition) for any reason within 30 days of the original purchase date. We cannot refund the shipping & handling fees, or installation charges. Charges for shipping returned products back to us are your responsibility. Capitol Pools will refund or exchange the item per your request. Chemicals: Sales of all pool/spa chemicals are final and cannot be returned. Please select carefully. Custom Orders: Custom ordered items may only be returned for manufacturers’ defects and workmanship warranty claims. Purchased Items: Purchaser shall look solely to the manufacturer’s warranty for relief from product defects and workmanship. Capitol Pools will assist with warranty claims and provide warranty service pursuant to the manufacturer’s warranty coverage. Capitol Pools Workmanship: Capitol Pools warrants its installation workmanship for a period of one year from the time of installation. Capitol Pools is not responsible for acts of others, misuse, or neglect on behalf of the purchaser. Capitol Pools makes no warranties expressed or implied of merchantability or fitness for a particular purpose with respect to any purchased item(s). Capitol Pools will contact you on Friday or Saturday of the week prior to your selected service week to confirm which day we will service your pool. Additional mileage: Outside of Dane County or travel distance beyond 30 miles of Capitol Pools business location, (2890 Terra Ct. Ste. 12, Sun Prairie, Wisconsin, 53590), is additional and charged at a rate of $3.00 per mile measured one way. Technician labor after the first 1/4 hour on site is charged at $72.00 per man hour and billed to the nearest 10th of an hour. In some instances a general laborer is needed to assist with the installation and will be charged at $48.00 per man hour using the same formula described for technician labor trip fee and time calculations. Any other parts, materials, and supplies used to complete the installation. In some instances a licensed electrician, plumber, or other professional trades person may be retained to complete the installation and will be billed at their normal service rate. The Installation Cost of the Item(s) payabale upon invoice. If you would like to discuss an estimated installation cost please call 608-837-7665. Capitol Pools will haul away replaced pool equipment at no additional charge. Capitol Pools reserves the right to refuse installation of an item in any situation that is not up to current construction codes or is deemed unsafe.